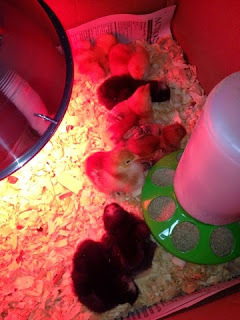 The Hayes Homestead: We've got chickens!! 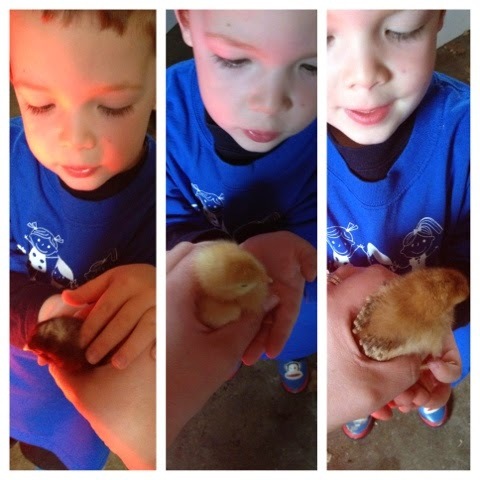 When we bought our house last summer, we knew that, at some point, we would like to raise chickens. We didn't think that we'd be ready for another couple of years and that we would focus more on things inside the house and the garden. Leave the chicken coop for a couple summers from then. Fast forward eight short months and guess what we have!?!? 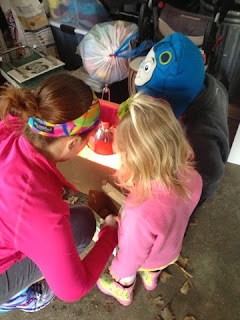 We decided that the sooner we got chickens and they started laying eggs for us, the better. We have upped our egg intake significantly in the Hayes house in the last couple of months. We are currently going through 2 to 3 dozen eggs per week. And that's just breakfast! So, after a little research and planning we decided to go for it. 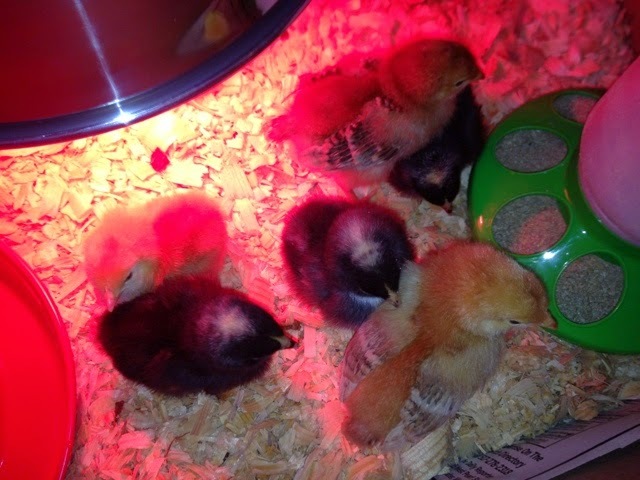 We ended up with three Barred Rocks, three Rhode Island Reds and two ISA Browns. 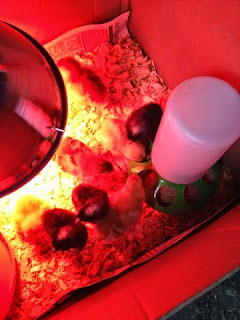 We have them in the garage right now all nice and cozy in their warm brooder (aka a large cardboard box). We're learning as we go and thank goodness for the internet! I have found some great resources that I can go to when I have a question about our chicks. We're waiting on naming them until we can actually tell them all apart. Although Jason and Redmond have already picked their names out. I am really surprised at how much I am loving taking care of these babies! I check on them multiple times a day, talk to them and try and hold them all.....although they don't really appreciate that much! The ISA Browns are super sweet and will fall asleep while you're petting them. The Barred Rocks (the black ones) are super sweet as well. 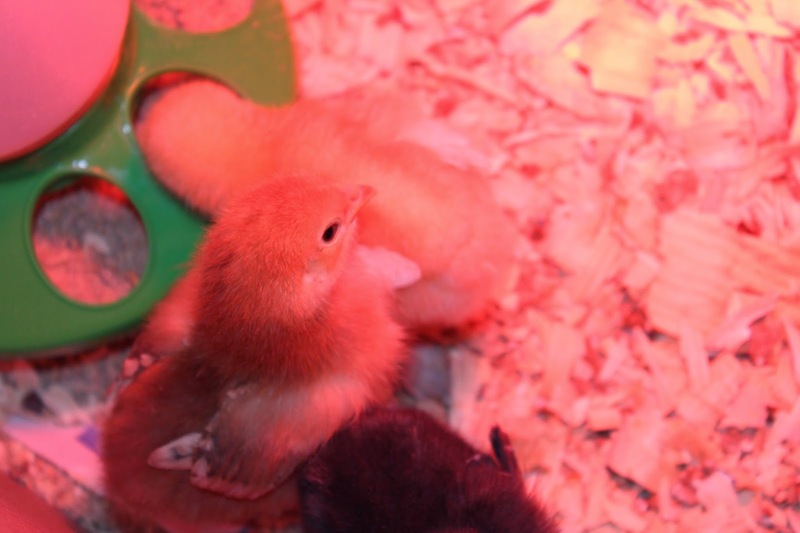 The Rhode Island Reds are feisty little ladies and quite a bit bigger than the other chicks. Love them! 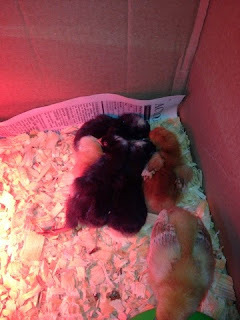 Redmond is the only one besides myself who has held the chicks. Jason talks to them, but won't hold them. So funny! Stay tuned for updates on the chickens as well as progress on our chicken coop!